As a kid, I dreaded science fair projects. I liked in-class science experiments just fine, because they always came with carefully articulated directions from start to finish. But coming up with my own idea for an experiment? That was a completely different beast. In seventh grade, I decided to test whether water temperature affected plant growth. My mom brought home two kale plants for me to use in my experiment, figuring that they were fairly robust plants and thus a good choice for an unseasoned brown-thumbed gardener such as myself. In the end, I wasn’t able to say whether kale plants grow better with warm or cold water, but I was able to say definitively that kale plants don’t grow very well when you don’t water them at all. Oops. Perhaps on a subconscious level, I forgot to water them because I’ve never really liked kale very much in the first place. But since kale has been growing in popularity the past few years and I hear it’s supposed to be good for you, I’ve made an effort to try to like it. While it’s doubtful that I’ll ever be enthusiastically repping the green smoothie movement, I have finally found a recipe in which I find kale actually tolerable and even—dare I say it?—palatable. 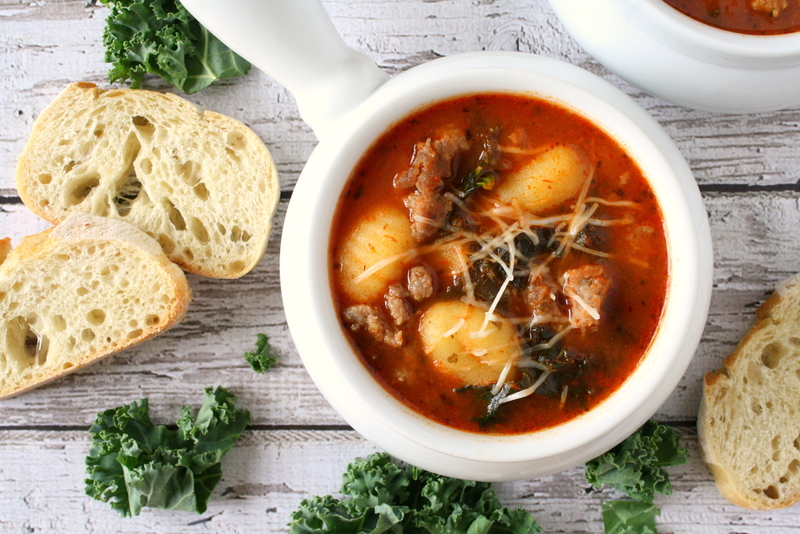 Simmered for a few minutes in this Italian tomato gnocchi soup, kale loses its slightly dusty, bitter flavor and takes on a pleasantly tender crunchiness. I don’t want to focus too much on the kale, however, since this soup has a lot more going for it, despite its surprisingly short ingredient list. That’s right—you only need five items (and twenty minutes) to make this soup, thanks to a “secret” base ingredient: spaghetti sauce! The spaghetti sauce adds all the seasoning you need, so you only have to add a few things to bulk up the soup: kale, sausage, and gnocchi. 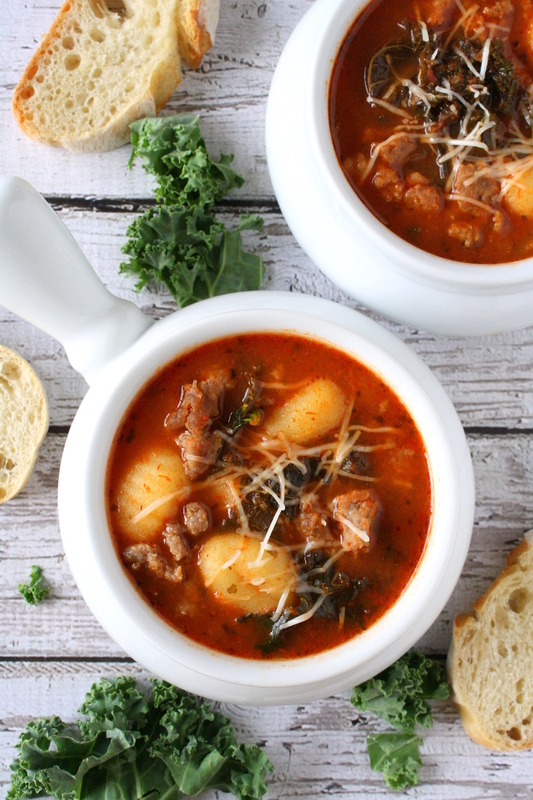 And since gnocchi cooks in a mere fraction of the time it takes for pasta to cook, this Italian tomato gnocchi soup will be one of the quickest recipes in your repertoire! 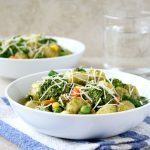 It has all the flavor and comfort of a soup that simmers on the stove for hours, but it’s a great option on even the busiest of weeknights. Pair it with a baguette or some dinner rolls for a hearty and filling meal that is perfect for chilly weather! Place the spaghetti sauce and chicken broth in a stockpot and bring to a boil. Meanwhile, crumble and cook the sausage in a skillet until lightly browned and no pink remains. Set aside. Once the soup comes to a boil, add the kale and cook for 2 minutes, stirring occasionally. Add the gnocchi and cook 2-3 minutes, or until they rise to the surface of the soup (if the kale is covering the surface, gently push some aside with a spoon to check if the gnocchi float up to the top). Stir in the cooked sausage. Serve and sprinkle grated parmesan on top of individual bowls if desired. Be sure to use a good quality spaghetti sauce, because the flavor of the soup is largely determined by that! I use Trader Joe's roasted garlic variety, but feel free to use any type you like. You can also substitute ground turkey or ground beef in place of sausage. This soup looks SO good! I’m not much a fan of kale – it’s just too bitter for me! I would totally eat it in this soup! Thanks, Cristina! Kale will never be my favorite veggie, but I was surprised at how well it turned out in this soup. I hope you get a chance to try it! 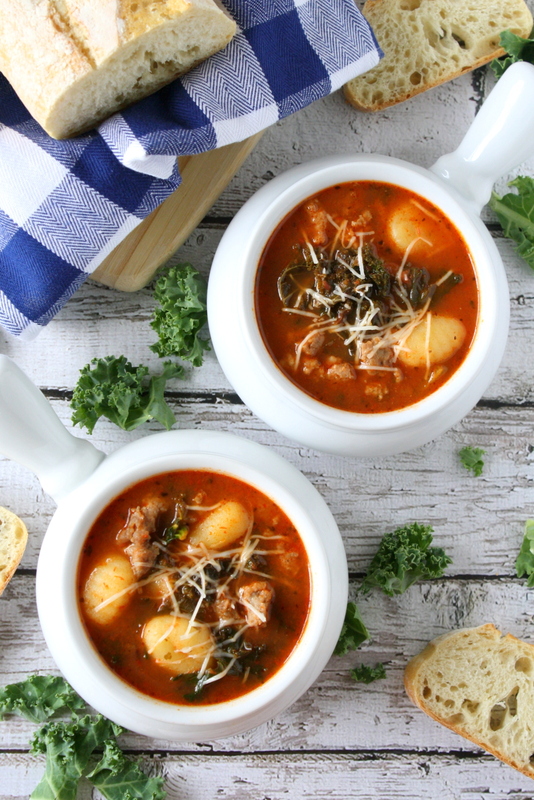 It’s hard to pass up a bowl of gnocchi soup, isn’t it? Thanks so much for stopping by, Sarah! What a lovely and simple recipe! This soup looks yummy! Can’t wait to try this. Thanks for sharing. Thanks, Anita! I hope you get a chance to try it soon. We made this delicious recipe for dinner tonight. It is deceptively easy to whip up. The soup is hearty, packed with flavor and is very satisfying. We served the soup along with a green salad and homemade dinner rolls to round out the meal. 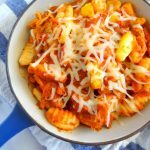 I would have never thought to use spaghetti sauce as a soup base, but your idea is genius! Another CakePants triumph! Thanks so much for reporting back – I’m glad to hear that you enjoyed it! I did feel like I was thinking outside the box for using spaghetti sauce as a soup base…until I looked at the jar as I was putting it in the recycle and saw the jar itself reads “use as a sauce for pasta…[or] an ingredient in stews and soups.” I’m glad we’ve both now discovered this new use! i bet it would taste even better with fresh homemade tomato soup. I do not buy anything readymade but will try this with homemade soup. I’m sure it would be delicious either way! 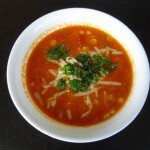 Do you have a favorite recipe for tomato soup? Yes, I do. It is very simple. Do you want one that is cream based or more veggie? The veggie based one would be great! Will get one up soon. Thanks, Jess! I hope you enjoy it as much as we do. We’ve already made it three times in three weeks! It really is! Thanks, Julianna! What a beautiful soup Mara! Brown thumb? I used to be a good gardner but have gotten lazy. Thanks so much, Julie! I’m really terrible with plants, although I *have* managed to keep an aloe vera plant alive for 6 years. Thankfully dogs are easier…they tell you if you forget to feed them! Haha I totally second your opinion on kale, Mara! 🙂 Also, I could’ve saved you time and told you that plants like water. I’ve been down that road before. I’ve also learned that plants don’t like too much water, either. Oops! But let’s talk about this soup. It looks amazing! Gnocchi was one of the first Italian recipes I ever learned how to make, and it still holds a special place in my wannabe chef heart. 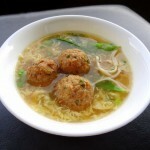 I love the idea of using it as a base for this soup. Pass me a spoon and a bowl, please!! Indeed, my conclusions for that experiment were less than scintillating. And wow, homemade gnocchi?! I have yet to attempt that but it’s on my list of ideas for at-home date nights. Hopefully we’ll get around to trying it soon! I have to say my first thought about watering down spaghetti sauce was “eww” but after my better half made this for dinner, all I could think was “TASTY”. This will be one of our go-to week night dinners. I love the simplicity of your recipe. I’m all about comfort food right now since the cold weather is starting to settle in. Pinned for later! Thanks, Lily! I hope you get a chance to try it. I’m sure I’ll be making it again soon when I need a break from all the time-consuming holiday cooking! 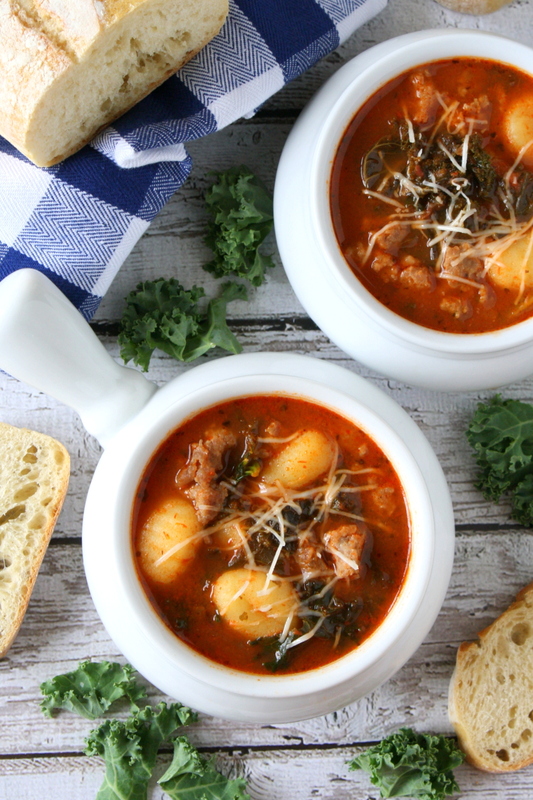 Fresh tomato soup and home-made gnocchi would make this all the more divine! Have you ever tried massaging kale with lemon juice, garlic, olive oil and a pinch of salt? It will make you a believer in kale!